Today, the Center for Medical Progress released the full, uncut video of the undercover visit to the Planned Parenthood abortion facility in Houston, Texas, that was summarized in the a shorter video released earlier this week. That longer video contains new revelations that some aborted baby remains sold by Planned Parenthood go to biotech companies for the purpose of creating “humanized” mice. The full video, which runs for five hours and forty-five minutes, expands on a conversation between Melissa Farrell, Director of Research for Planned Parenthood Gulf Coast, and two CMP actors posing as representatives of an organ procurement company. That conversation focused on potential compensation to Planned Parenthood in exchange for fetal remains. 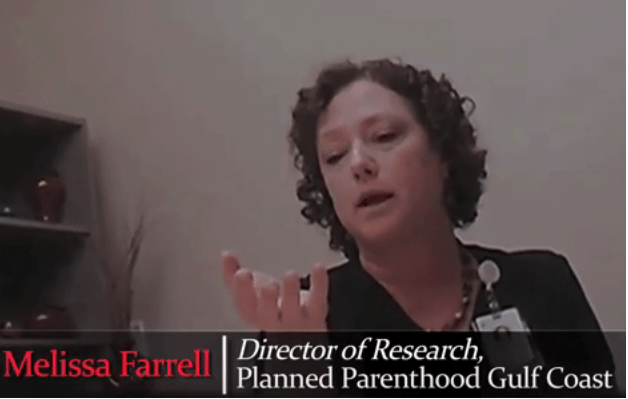 Farrell made it clear that Planned Parenthood had been involved in the selling of aborted baby parts for some time and was very familiar with the use of fetal remains in the production of humanized mice. Apparently, Farrell had the routine down pat. She emphasized repeatedly that she creates a written line-item budget for compensation that effectively conceals the fact that the money received from fetal remains is actually a financial benefit to the company above and beyond hard costs. In addition, she noted that they are able to alter abortion procedures to make sure they have baby parts to sell. “And we have had studies in which the company, and or in this case, investigator, has a specific need for certain portions of the parts of conception and we base that into our contract and our protocol that we follow this, so we deviate from our standard in order to do that,” Farrell said, (emphasis added). Yet Farrell acknowledged that it was illegal for them to alter the timing or manner of the procedure for the purpose of ensuring organs were fit for use by researchers. In the lengthy video, Farrell is seen looking over her e-mail when she finds a message from an immune-biology laboratory that was requesting fetal tissue to create humanized mice. The full conversation can be reviewed beginning at the 4:27:45 time marker on the full video. Part of the conversation was included in the CMP summary video published earlier in the week. The purpose of the request was to obtain cadavers and fetal tissue to generate humanized mice for immune-deficiency experimentation and the development of pharmaceuticals. “Everything! CNS, brain, kidney, thymus, liver, spleen, femur, bone marrow, hematopoietic stem cells, from 14-22 weeks gestation,” Farrell responds in a sing-song voice. “They’re going to engraft all those? Or just the hematopoietic?” asked the actor. “It doesn’t say,” Farrell says. “That is actually going to be ideal for them,” the actor continued. “A hundred and twenty? This is huge!” says the actor. To illustrate exactly how big this request was, earlier in the conversation, the actors told Farrell that they were interested in obtaining liver-thymus pairs from the same donor, which would then be supplied to a laboratory that was hoping to create humanized mice. But the actors only hoped to harvest one sample per week, adding that five to six per week would be better. What exactly are “humanized” mice? Around the year 2000, a line of mice created through breeding and genetic alteration to suppress the immune response that prompts rejection of foreign tissue. This was around the time that Operation Rescue first discovered that scientists had begun experimenting with stem cells derived from aborted babies and began speaking out against it. With the rodents’ immune systems suppressed, human fetal cells or tissue could be transplanted or grafted into the mice where it would grow. For example, “hematopoietic” stem cells mentioned in the CMP video are cells related to the creation blood. Grafting these cells into mice would create blood that more closely resembled human blood. Then researchers could conduct experiments on these “humanized” mice and get results more reflective of how a human being’s blood would react. Mice continue to be altered and bred to allow their tissues to take on more realistic human properties. In the case of the immune-biology group discussed in the video, they were seeking a very large order of essentially 120 intact fetal cadavers from 14-22 weeks gestation. The bodies would then be dissected to extract the desired tissue, which would either be transplanted into mice and grown, or processed into cells that would be grafted or injected into mice. For years Planned Parenthood has benefited financially from the illegal sale of aborted baby remains, which has created a lucrative additional revenue stream for the abortion giant. It is clear from the full contents of the latest CMP video that Planned Parenthood is aware of the laws that regulate fetal tissue “donation” and have constructed an elaborate scheme to conceal and even justify their illegal activities. Operation Rescue puts the blame for this illicit market in aborted baby remains squarely on the shoulders of greedy Planned Parenthood officials who are operating more like a cut-throat for-profit industry than a non-profit charity. Texas Attorney General Ken Paxton testified before the a Texas legislative hearing on July 29, 2015, that his investigators visited the Houston Planned Parenthood’s tissue room and observed recognizable body parts from aborted babies being dumped into a red trash bag. He noted that this facility generates 260 pounds of fetal remains per week, every week. It is difficult to even mentally process the enormity of that number and what it means in destroyed human lives. LifeNews.com Note: Cheryl Sullenger is a leader of Operation Rescue, a pro-life that monitors abortion practitioners and exposes their illegal and unethical practices. This entry was posted in Uncategorized and tagged alter abortion procedures, “Humanized” Mice, banned partial birth abortion procedure. Bookmark the permalink.